St. Lucia's flood (Sint-Luciavloed) was a storm tide that affected the Netherlands and Northern Germany on December 14, 1287 (the day after St. Lucia Day) when a dike broke during a storm, killing approximately 50,000 to 80,000 people in the fifth largest flood in recorded history. Much land was permanently flooded in what is now the Waddenzee and IJsselmeer. 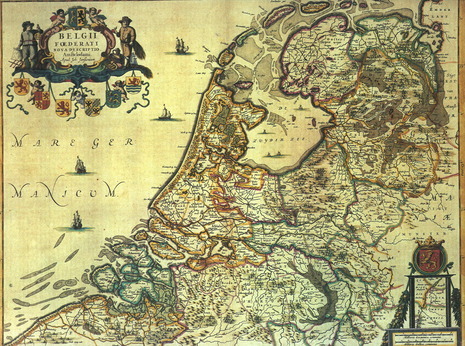 It especially affected the north of the Netherlands, particularly Friesland. The city of Griend was almost completely destroyed, only ten houses were left standing. The name Zuiderzee dates from this event, as the water had merely been a shallow inland lake when the first dikes were being built, but rising North Sea levels created the "Southern Sea" when floods including this flood came in. Although not known by the name of St Lucia, the same storm also had devastating effects on the other side of the water in England. The city of Winchelsea on Romney Marsh was destroyed (later rebuilt on higher ground). Nearby Broomhill was also destroyed. The course of the nearby river Rother was diverted away from New Romney, which was left a mile from the coast, ending its role as a port. The Rother ran instead to sea at Rye, prompting its rise as a port. A cliff collapsed at Hastings, blocking the harbour and ending its role as a trade centre, though it continued as a centre for fishing. Parts of Norfolk were flooded, eg the village of Hickling where 180 died and the water rose a foot above the high alter in the church. The port of Dunwich in Suffolk began its decline. Winchelsea in Kent also reported to have been hit by the surge. 14 December 1287, North Sea Countries: A mighty storm sends a high storm surge onto Holland, drowning a reported 50,000. In East Anglia, England, 500 lives are lost. On Dec. 14, 1287, a heavy storm over the North Sea generated surging waves that collapsed a thin land barrier, flooding the Zuiderzee inlet. A significant percentage of the country’s population perished in the disaster, and it has been rated as one of the most destructive floods in recorded history.